Q. How can I locate records and correspondence between patrons and clergy related to Tiffany Studios' glass memorials? I am looking for primary sources (records, correspondence, etc.) rather than books and articles. A Public Library Memorial. From Memorials in Glass and Stone (New York: Tiffany Studios, 1913). Rakow Research Library. Bib ID: 53794. Hello! Thank you for your question! In terms of records and correspondence relating to Tiffany memorials, the Rakow has an archival collection that might be useful: the Jeffrey Rush Higgins collection on Frederick Wilson, 1885-1990. Wilson became the head of Tiffany Studio's ecclesiastical department in 1899. The collection includes commission letters and other correspondence, church bulletins and other church ephemera, scrapbooks, and design drawings. You might also be interested in photocopies of correspondence, records, and articles relating to the John Hoare memorial chancel window "Cornelius and the Angel" (Christ Church, Corning, New York, 1897) that are held in the Rakow's collection. Another item of interest might be the First Presbyterian Church's Mother's Day service program (available online), dated May 12, 1946, which features an image titled "Our memorial window" by Tiffany Studios in memory of Russell Sage. Written in blue ink along top and bottom edges are notations that include "Two years to make" and "cost $5,000.00." 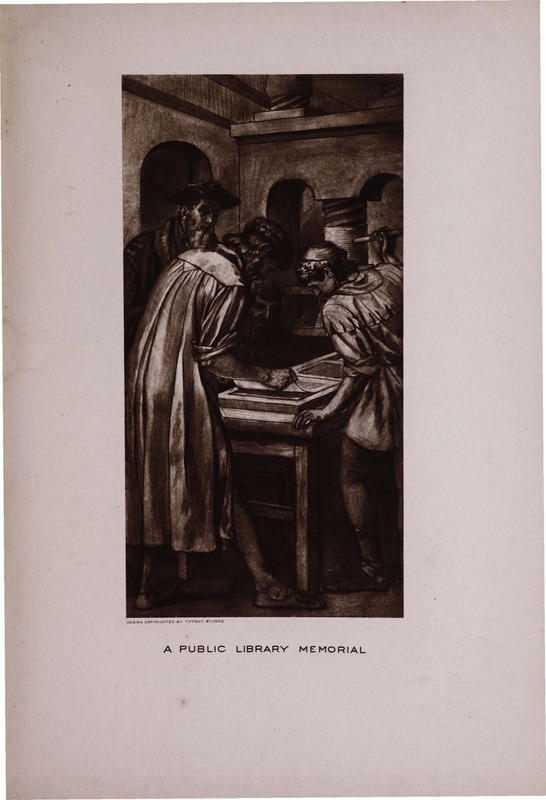 You can also look through Memorials in Glass and Stone, an extensive advertising brochure published by Tiffany Studios in 1913, which was digitized from a physical copy held in the Rakow collection and made available online. Though you are not interested in books and articles about Tiffany memorials, scanning notes and bibliographies in published resources about Tiffany Studios and glass memorials may make you aware of additional archival resources and their locations. A search of Rakow Research Library Catalog will return records for several books and articles that could be useful in this way. Our staff has put together several bibliographies about Tiffany that are available on request. More extensive lists of resources are available upon request. Please let us know if we can be of further assistance via Ask a Glass Question (http://libanswers.cmog.org/) or by email (rakow@cmog.org) or phone (607-438-5300). Please don't hesitate to contact us with glass-related questions in the future! Does the Rakow Research Library have Tiffany Studios/Tiffany Glass and Decorating Company archives? Could you help me locate information on Louis Comfort Tiffany's work as a stained glass designer?